Balloon racing returned to the Indianapolis Motor Speedway in 1910. Again, Speedway President Carl Fisher partnered with his friend and ballooning mentor, George Bumbaugh in their craft, "The Indiana." This article discusses preparations for the Indianapolis Motor Speedway's national championship balloon races in September 1910. The Speedway hosted these races both in 1909 and 1910. 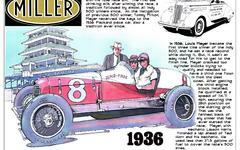 The decision reflected Speedway President Carl Fisher's love of aviation. The 1910 season was particularly busy for the Speedway as it hosted an auto show in March, three major automobile race meets, an aviation meet featuring the Wright Brothers and the balloon championship. Fisher's Balloon Caught in Gale - and Electric Wires! This article reports on an exhibition flight of Carl Fisher's balloon, "Indiana." The flight took place a little over a week prior to the Indianapolis Motor Speedway's national championship balloon races. At the helm was the balloon's creator, George Bumbaugh, who was also Fisher's mentor in this craft. Fisher was not aboard for what proved to be a harrowing flight when the vessel was caught up in heavy winds and briefly became entangled in electric wiresstrung on poles near the Speedway. Good read. This is a nice collection of articles on various preparations leading up to the September 1910 national championship balloon races at the Indianapolis Motor Speedway. This short piece discusses preparations for a trial of Carl Fisher's second big balloon, Indiana. His ballooning buddy, George Bumbaugh designed and build the vessel in the coliseum at the Indiana State Fairgrounds. One interesting fact that comes to light is that the Fisher-Bumbaugh effort in the first national championship balloon race at the Indianapolis Motor Speedway (June 5, 1909) the first Indiana was disqualified when the two men anchored just above the ground to obtain some water.